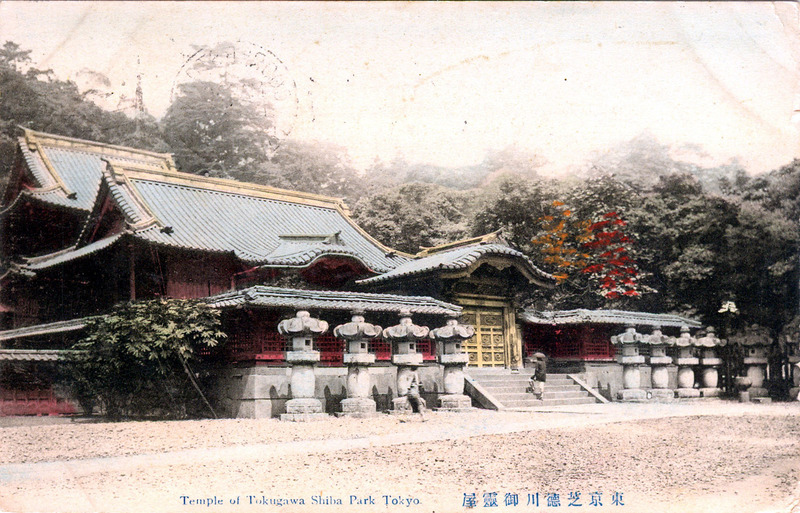 Tokugawa temple, Shiba Park, Tokyo, c. 1910. “Then in addition to the attractions of the Kwankoba [bazaar] itself, there is the fascination of its surroundings. It is in the romantic region now called Shiba Park, a neighbourhood once sacred as the precincts of the great Temple of Zozoji, honoured by the special patronage of the Tokugawa family, and the last resting-place of many of the Shoguns of that house. “I shall not try to describe the marvels of the mausolea of the Shoguns, which stand each in its own grounds beside the main temple; their wonders of gold and colour, their carvings and find lacquer, have made them famous among the masterpieces of Japanese art. 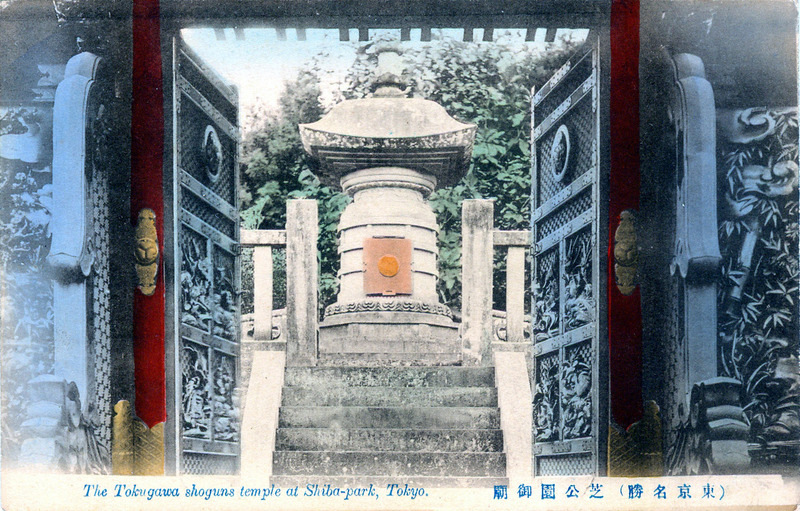 A carving representing Nirvana, Tokugawa temple, Shiba Park, Tokyo, c. 1910. 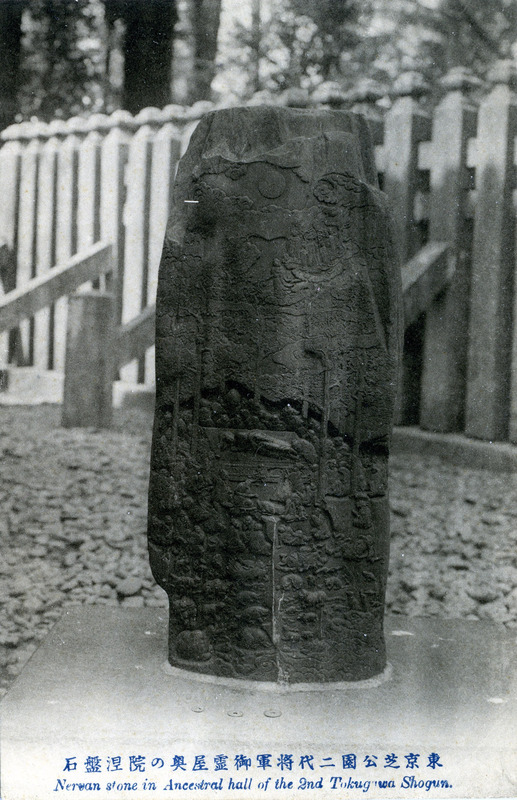 One of two stone carvings, dating from 1644, outside the building, carved by Yoshioka Shigetsugu (Soju) of Yedo. 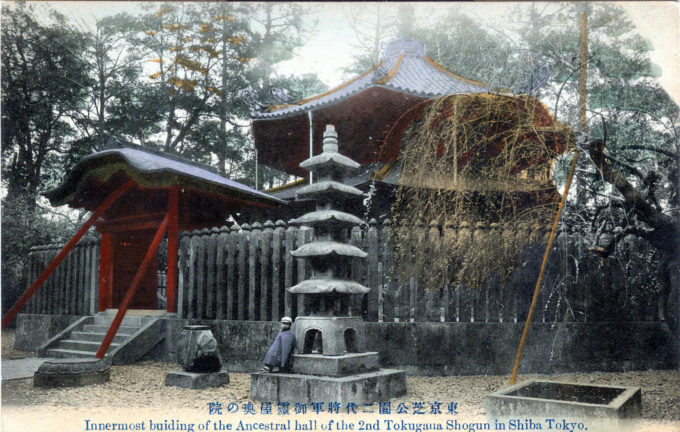 “In the wood at the back is the Hak-kaku-do or ‘Octagonal Hall,’ containing the Tomb of the 2nd Shogun, Hidetada, the most magnificent specimen of gold lacquer to be seen in Japan, and one which no tourist should fail to visit. The interior walls are gilt over lacquer. Eight pillars covered with gilt copper plates support the roof.